Friday I attended my Chemo 101 class. I learned more than I wanted to know and way more than my mind can comprehend at this point, and I don't even have "chemo brain" yet. Which I learned is an actual thing. Basically, it's like pregnancy brain, mom brain and zombie brain - basically you're temporarily real dumb, living life in a bit of a haze. I can't decide if I'm at a disadvantage due to my current mom brain state or if I'm at an advantage - I mean, I have been functioning as a sleep deprived mom of 2 boys, maybe the Chemo fog will seem normal? I'm gonna hope so! I toured the Chemo floor (UF Cancer Center) and know where I'll be receiving the treatments. I have my list of drugs that will be in my Chemo regime (I'm trying to stay of Google). I'm learning new lingo and I'm amassing a stockpile of hand sanitizer and antibacterial soap. In short, I'm trying to prepare the best I can for treatments. Today, I took the next step toward treatment. 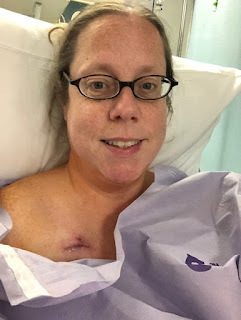 I had my Chemo port placement surgery. As far as procedures go, this one was as easy as it gets. I remember talking with the nice nurses while they were getting me all positioned on the table. Next thing I knew, I was in the recovery area talking to a new nurse. Easy peasy. Big shout out to anesthesiologists everywhere - mad love from me! So, here it is folks, my Chemo port. For what it’s worth,you look cute! Love your writing and love you! Annie you are so brave and are going about this whole adventure with such logic and rationality! I am sorry you have to go through this! At the very least, your readers are learning much from you about not only breast cancer, but resilience and faith. Love you!